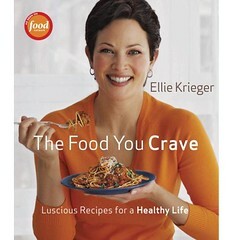 While cruising through the cookbook aisle of a bookstore recently, The Food You Crave by Ellie Krieger caught my eye. It must've been the orange shirt she's wearing on the cover, not many people can pull that off. As I thumbed through it, I got really giddy. My [arbitrary] criterion for whether I am allowed to splurge on a cookbook is whether I would want to make at least half of the recipes that I see while flipping through. Well, Notoriously Picky Amy wanted to make every single recipe in this one. Unprecedented! Plus the recipes are all healthy-ish and include nutritional info...bonus! Obviously, I had to buy it. Imagine my delight when, later that day while poking around online, I found Craving Ellie in my Belly (from here on referred to as CEiMB): a blogging group whose members take turns selecting a recipe from The Food You Crave each week to make and blog about. Count me in! 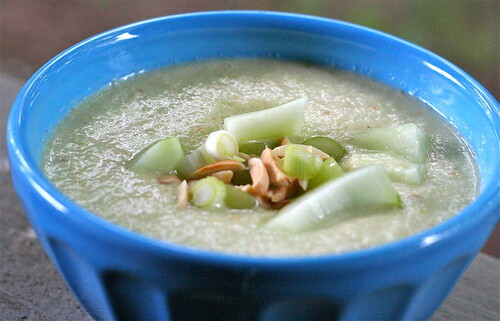 For my first weekly CEiMB post, the recipe is White Gazpacho with Grapes and Toasted Almonds, hosted by I'll Eat You. Sort of an unusual combo, but since I liked all the ingredients separately, I was intrigued. Put 'em all together in the food processor, and the end result is magical. If you're looking for a unique, refreshing summer soup, this gazpacho is your new best friend. 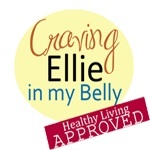 You can find Craving Ellie in my Belly posts here on Thursdays, and you can join the group or see who else is participating here. Ellie says: A refreshingly updated version of the classic tomato-based cold Spanish soup, this gazpacho starts with a beautiful pale-green cucumber broth, light and cool, with just enough body to give it substance. It surprising garnishes really bring it to life. Chopped scallions, toasted slivered almonds, cucumber chunks, and sweet-tart green grapes add an exciting mix of textures and flavors and keep it all elegantly green and white. This soup has so much visual and taste impact it's perfect for a dinner party where you really want to impress. It is also fun to serve half-portions in martini glasses at a cocktail party. Welcome to the group! I am so glad you liked your first recipe - makes it easier to stick around for more! I was too big of a chicken to try this one, but after reading your post, maybe I'll get brave! Welcome to the group! I really liked this gazpacho, too and I agree with you that it's a perfect light and refreshing summer soup. Welcome to CEiMB! How great that you loved the first recipe! There sure are alot of great ones in this book. Your gazpacho looks delicious! You are so right.. I have found an new friend and I'm hoping that the tomato version is just as friendly. Great post and welcome to CEimB! "It must've been the orange shirt she's wearing on the cover, not many people can pull that off." I love your blue bowl! Glad to be a newbie with you......see you next week!